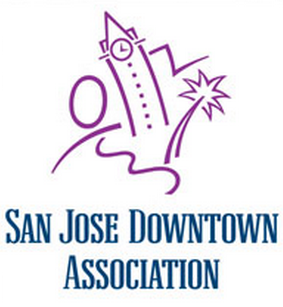 The Downtown Doors project was recognized by the International Downtown Association (IDA), where the president of the IDA even said that the program sets the standard for best practice in the industry. The next HER city event is Oct. 25 and features appetizers and drinks in the Hedley Club followed by the musical MEMPHIS (including a backstage tour). Tickets are available at sjdowntown.com/hercity. Hawaiian Airlines and KIristi Yamaguchi's Always Dream Foundation will be title sponsors for Downtown Ice, kicking off Nov 16th. The parking lot wall on Almaden and Woz has been adorned with new artwork, which extends across 33 sections of wall and 1,868 sqft. The project took 2 months to complete. The Poppy Farm at the San Pedro Square Market is now regularly open for buisiness, as is Loteria Taco Bar. AJ's Hot Dogs is now open in SoFA. The Earthquakes are breaking ground on their new soccer stadium with a public ceremony on Oct. 21. They are also trying to break the Guinness World Record for most people taking part in a ground-breaking ceremony.